A. Students have been given detailed instructions, examples, and notes in class! I have made myself available for a month and a half to check and approve each design for heraldic correctness. We are working on these designs in class and students should come to class daily prepared to work on this design , but the actual construction of the full sized shield/finished product must be done at home. Please, don't put this off until the last minute! B. I have agreed to cut any plywood, tag board, etc. for the students here at school as long as it is the correct size, No smaller than 22 x 29 in. and in my class room no later than 3:00 PM on Friday 01/30/15- . First come, first cut. Note- If I receive a glut of material at the last min., it will take longer to finish the work and it will take longer for you to receive your cut shield shape. Again, don’t put this off until the last minute. C. OPTIONAL!!!!!!! How to curve your shield like many of the originals- http://hightowercrossbows.com/shieldhowto.htm . Remember yours will be a different shape (you will use the one in class as a template) than the one in the diagram. 1. Make a paper stencil here and bring it home. 2. Bring their material here to trace the standard outline/template. 1._____ Construct a coat of arms using the rules of medieval (not modern) heraldry and the notes/examples I gave you. Each design will have (at least/no less than) 1 division,1 ordinary/sub-ordinary, your correct cadency mark, and 1 properly displayed charge. Note, any/all submissions that do not met all of above requirements will be considered incomplete and returned to the student to finish/redo correctly before I can count it, received for a grade. Please review the late policy on long term projects and grades and plan accordingly. 2. _____ This design must use the tinctures and charges that match your personality. Carefully search your notes and decide which best represent your personality. 3. _____ One neatly typed clearly written (in paragraph form) explanation of each of the tinctures, charges, etc. and how they represent you. [Neatly attach to the back of your full size shield.] You will be asked to explain (not read) this to us in class. These should be typed, . DUE- with your completed shield. 4. _____ One 8 1/2 x 11 (full color) detailed drawing of this design. [Neatly attach to the back of your full size shield with your paragraph before you turn it in.] These must be O.K.ed and signed by me before you start on your large (final) shield. Again, If I receive a glut of these on the deadline, It will take longer for the approval to reach you. Please plan accordingly. DUE- I will review and sign these when they are turned in, any time after 01/05/15 and before 02/20/15. 5. _____ One full sized (templates are available in class. ) shield with your coat of arms neatly and clearly (in full color) displayed to be hung up in the classroom. Students must use this template or their work will not be displayed! Note- the (#3 above) paragraph and your drawing (#4 above) will be neatly/carefully attached to the rear of all completed shields before they arrive in class. Any/all paint/glue must be completely dry before you bring this to my class! -All late work will begin grading at 60% of the project grade and decline from there depending on the number of days late. Here,http://www.digiserve.com/heraldry/symbols.htm Virtues matched with tinctures, charges, lines and ordinaries. Use these for more information and to find suitable models for your charges and ordinaries. These shields will be displayed for the whole 7th grade to see so do your best job. It will represent you to your peers! http://heraldry.sca.org/library.html The SCA/Society for Creative Anachronism Heraldry Archive/library. 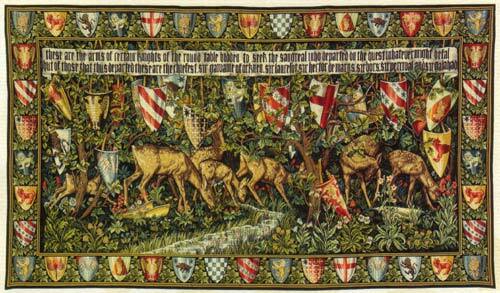 http://images.google.com/imgres?imgurl=http://freepages.genealogy.rootsweb.com/~jkmacmul/heraldry/buck.gif&imgrefurl=http://freepages.genealogy.rootsweb.com/~jkmacmul//heraldry/beasts.html&h=75&w=58&sz=3&hl=en&start=38&um=1&tbnid=Almzm0tTlOtveM:&tbnh=71&tbnw=55&prev=/images%3Fq%3Dheraldic%2Bstag%26start%3D20%26ndsp%3D20%26um%3D1%26hl%3Den%26safe%3Dactive%26rls%3DRNWE,RNWE:2004-46,RNWE:en%26sa%3DN&safe=on Heraldic charges and their modern meanings. Remember, you need the medieval meanings so be careful with this site! http://www.princetonol.com/groups/iad/lessons/middle/herald.htmList of links for you. Get your materials ready now! Parents- Students will need a 22in. x 29 in.or larger rectangle of cardboard/ tag board/ particleboard/plywood/etc. 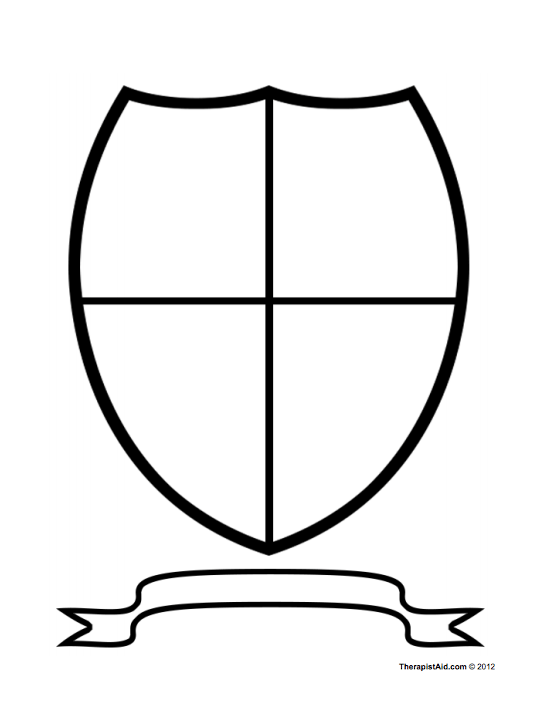 (up to 1/2 in thick) for a correct size shield shape on which to display their finished coat of arms. I have templates to trace the shield shape (everyone's will be the same size and shape) onto their cardboard, plywood, etc. and I will cut the heavier materials (no thicker than 1/2 in) on the school's band saw if I receive them no later than 01/30/15. Have your child put their nameon all materials before they come to school. Some students may wish to cover their shield face with cotton muslin fabric to make a better surface for painting. This is optional but I will go over the instructions for this in class for those who are interested. Remember, even if you cut your own shield material, each shield must be the same size, shape / be traced from the master in my classroom. Make arrangements/plans to facilitate this ( A.S.A.P.) in order to be finished by the deadlines. Again, last min. work rarely shows quality. A and B work shows quality, attention to detail and directions followed in all areas. You have two months for this, please, plan ahead. It’s a part of being human. However, if you find yourself having these kinds of negative thoughts frequently or letting these feelings get in the way of living a healthy and happy life, it may be time to do something about it. Luckily, there are many ways to beef up your sense of self-worth! It probably won’t be easy, but rest assured that it can be done. Building self-esteem can be a difficult, although very rewarding, journey for adults, but it’s much easier to plant this characteristic at a young age and tend to it as the child grows. If you are a parent, child therapist, teacher, or any other valued adult in the life of a child, I hope you can use these tools to seize the moment and begin cultivating a healthy sense of self-esteem in the children in your life. We’ll provide several methods and activities for building self-esteem, starting with worksheets for young children and ending with worksheets for adults. Primary or elementary school is such a fantastic time to start helping your child develop self-esteem, if you haven’t already begun. Children’s minds are generally so much more flexible and open than adult minds, making it the perfect opportunity to begin planting the seeds of a healthy self-esteem. The worksheet and activities listed below are some of the ways you can help a child develop the self-esteem that will act as a buffer from some of life’s most difficult obstacles and challenges. This is an activity that both children and adults can engage in, although this worksheet is specifically geared towards children. We will go over a similar worksheet for adults later in this piece. The “About Me” worksheet is intended to help children identify their own positive traits and characteristics, and recognize their accomplishments. It’s a simple worksheet with six sentence prompts and space for your child to fill in the blank. These sentences are constructed with clear and uncomplicated language that most primary school students should understand, but it may help to go over this worksheet with your child. Encourage your child to take their time and think about each sentence. Completing this activity can help children build the foundations of an authentic and healthy self-esteem that they can carry with them for the rest of their life. Click here or here to see the worksheet. 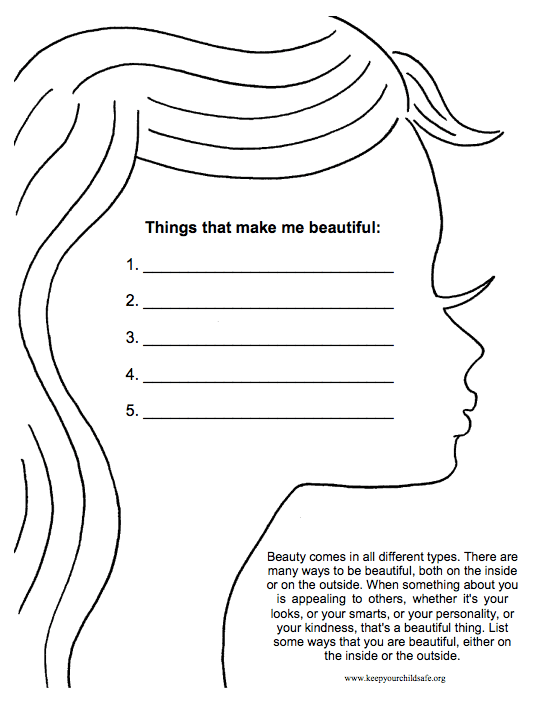 This worksheet was created specifically for young girls to help them learn about what makes a person beautiful. This worksheet should be completed with a parent or trusted adult to help walk them through the distinction between inner beauty and outer beauty. Also included is the prompt “Things that make me beautiful” and space to write five things. It’s okay to write something external, like “my hair” or “my eyes,” but make sure your child writes at least one or two inner traits or qualities in addition to the external qualities. It’s never too early to start combating the extreme focus on external beauty for girls, and this worksheet is a great start. Of course, it can also be used with boys to help them learn the same lesson. Click here or here to download the worksheet and give it a try. This worksheet can be an excellent way for young children to explore what makes them good or likeable people, and help them to build a foundation of healthy self-esteem. The instructions are to print it out and complete the statements, without worrying too much if you can’t complete them all, and keeping them handy for the next time you experience feelings of low self-esteem. 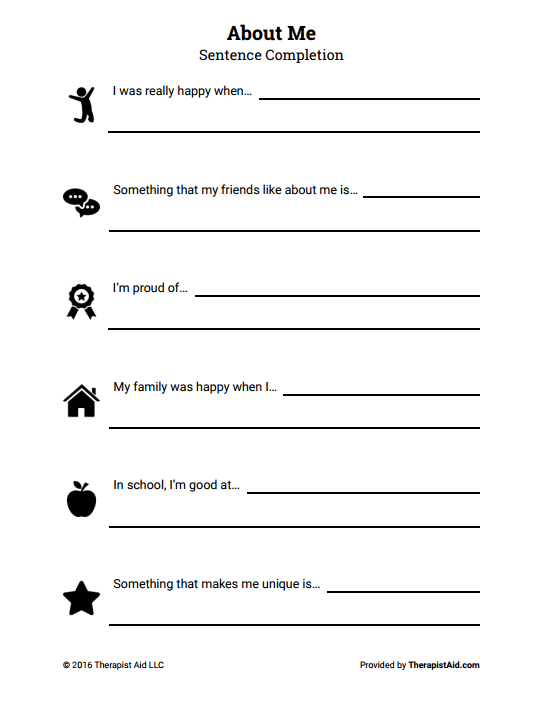 Completing this worksheet will give your child an opportunity to list all of the good things about themselves without fear of being overly proud or self-absorbed. It’s good to be both realistic AND positive about yourself, and this is a good way to begin that tradition of positive realism. Your child may need your help in completing this worksheet, but try to let them come up with their own ideas about the traits and characteristics they like in themselves. Click here or here to try this worksheet for yourself. This is a great worksheet for helping children to learn about what makes them good friends, and what they should look for in a friend. Completing this worksheet will likely take some guidance from an adult, but it can be a very positive way to start thinking about what kind of person they want to be. Next, it provides space for your child to write down five traits and explain why they are important in a friend. The minimal nature of this worksheet allows your child to put their imagination to good use. They might need some help from you, but they should be able to come up with several traits that they find important in a friend. 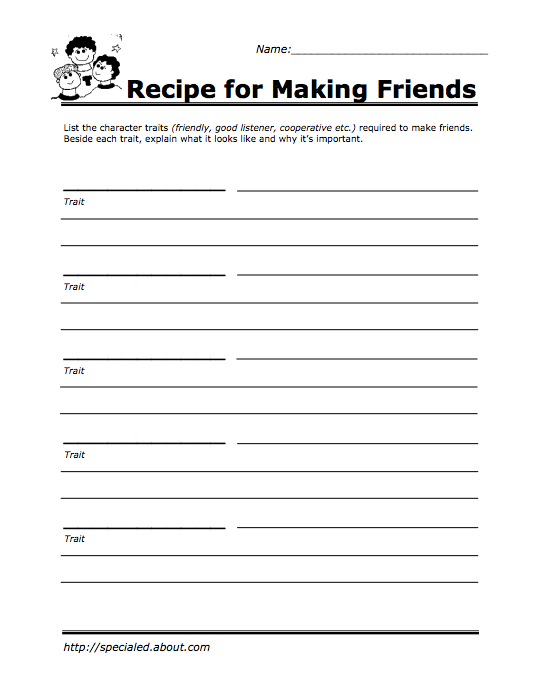 Click here or here to download this worksheet and help your child learn how to both find and be a good friend. This activity is great for any age, but this template is meant specifically for young children. To see a version for adults, scroll down to the section on worksheets for adults. This worksheet lists three sentence completion prompts for each day of the week, starting with Monday. Follow this or this link to download and use this worksheet with your child. While it’s best to start self-esteem building young, there is still tons of room for growth and development in this area for middle and high schoolers. The activities and worksheets below can help your teenager or adolescent start or continue building a healthy sense of self-esteem. Affirmations are positive. Never use the word not in an affirmation. Affirmations have a “feeling” word in them. Affirmations should be about your own behavior, never someone else’s. Once you have read and understood the guidelines, the worksheet provides space for you to write down some affirmations of your own. It’s okay to refer back to the guidelines as much as you need. Set big goals and stay mindful of your goals (write them down and place them somewhere you can see them every day). Say and visualize your affirmations every day. Take time to see yourself accomplishing the goals you’ve set. Think about how good it will feel once you have accomplished your goals – feel that feeling you would feel when the goal is accomplished. Next, the worksheet provides an example goal, affirmations, and ways to follow the instructions to meet your goals. Visualizing and planning for success in meeting your goals makes it exponentially more likely that you will achieve them. Give your child guidance and support when coming up with affirmations if needed, but let them take ownership of this activity and see the amazing results of their commitment. You can access the worksheet hereor here. This worksheet can be completed by adolescents and teenagers who wish to work on building or improving their sense of self-esteem and self-confidence. Print and complete the statements. Keep your completed worksheets handy. The next time you’re feeling low self-esteem and need a boost, read your worksheet and be reminded of your personal power, and use it to transform situations in which you feel less confident. The worksheet is divided into three parts. What do you say to yourself about the situation (self-talk)? How do you feel physically? What sensations and feelings do you have in your body? Part Two involves thinking of a recent situation in which you felt lacking in self-confidence and wish to change if you could, and answering the same four questions listed above. What could I do that would help me feel differently? (For example, create a visualization in which I remember how I felt in Part One). Completing this worksheet will help your teen or adolescent to explore their feelings in two very different situations, analyze their responses to these situations, and come up with an action plan to address their next low self-esteem episode. This exercise will help them take control of their development and give them a sense of ownership in their own well-being, a trait that will serve them well in the future. Click hereor hereto see the worksheet. This worksheet is a great way for your child to reflect on all the good things that he or she has accomplished already, and visualize their next big wins. The instructions are to write down three things you have succeeded at for each phase of your life up to this point. When you find yourself feeling down because you haven’t achieved what you wanted, you can refer back to this worksheet and remember all your achievements thus far and let your past success inspire you to future success. For each section, you should write down the age range you are assigning to each category (e.g., 0 – 10 years, 11 – 16 years, etc.) and list three accomplishments from each period. 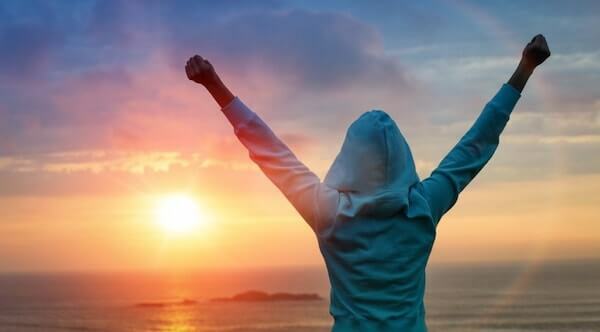 Even if you think you are a failure who hasn’t achieved much, this worksheet will help you to see that there are many things you have already succeeded at. At the least, you have succeeded in surviving to your current age – that’s a win! To see this worksheet yourself or download it for your teen or adolescent, click hereor here. This activity is especially great for teens and adolescents who are crafty and creative, although people of all ages and talents can take part. The coat of arms / family crest is an artistic prompt for your child to draw, paint, or otherwise represent the things about themselves that are important to them. There is an option to use a theme for this activity or for each prompt, like “family,” but it’s okay to engage in this activity with no specific theme in mind as well. This is a simple worksheet with only the “crest” divided into four quadrants and a banner underneath. In each quadrant, your child can represent the values and traits that they hold dear, and summarize them in the banner below. For example, if your child is dealing with self-esteem issues, they can summarize the coat of arms in the banner below as “What Makes Me Great” and focus on filling their coat of arms with reasons why they are a good friend, a good child, a good student, and a good person in general. This activity is a very basic technique that you can build on or add to as you wish. The point of this activity is simply to help your child identify their goals and list at least three ways in which they can work towards each goal. Striving towards and achieving one’s goals is an important and valuable way to build self-esteem. You build the most solid foundation of self-esteem and self-confidence on the building blocks of positive experience and success. The more children recognize their ability to meet the goals they set for themselves, the more likely they are to feel confident and worthy. This worksheet is a very simple space to write down three goals and three things your child can do to reach each goal. For a more detailed goal planning exercise, you can try this worksheet. It allows your teenager or adolescent to focus on one goal area in particular, and dive a little deeper in their planning for each milestone. This worksheet is a great way to help your teen or adolescent plan for a goal that is larger or more challenging than some of their more immediate goals. Another great worksheet from Paul Ogunkoya at www.self-esteem-school.com, this activity will help your teenager or adolescent learn to accept their failures and use them to learn and improve their chances of future success. We all fail sometimes, and it’s important for children and teens to learn early on that failure happens to everybody and does not mean the one who failed IS a failure. An example is provided to help your teen think about how to go about completing this worksheet. This worksheet encourages the development of an extremely valuable skill: recognizing that failing is a part of life, and that failures can lead to even greater success. Sometimes we have to fail in order to learn the lessons that propel us to greatness. Learning to fail gracefully and maintaining a sense of worth even in the face of failure is extremely important in keeping a healthy sense of self-esteem. Your teen may need help with the first mistake and plan to flip it, but they should catch on quick. To download this worksheet for your child, click here or here. You can download the printable version of the PDF here. Again, while building self-esteem is a practice best started young, it’s never too late to begin investing in your own self-worth. These worksheets and exercises from www.theranest.com are intended to help adults build up their self-worth. This worksheet from leads the reader through a sentence completion exercise for adults. This exercise is exactly what it sounds like: it includes prompts with blank space at the end for you to complete the sentence in the way that feels right to you. Completing this exercise can help you explore your thoughts and feelings, open up, and share them with others. 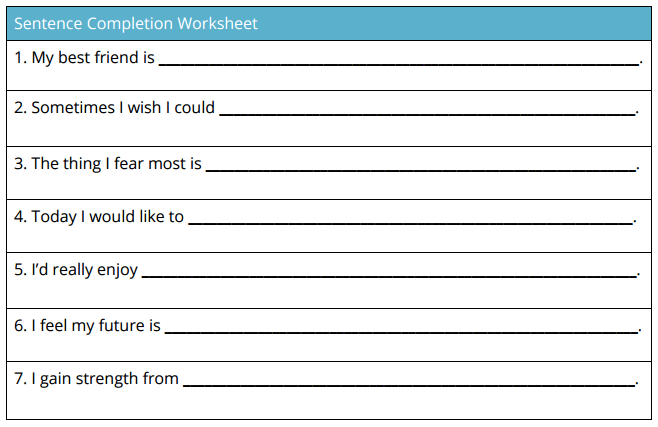 The instructions at the top of this worksheet inform the reader that this exercise will help them to become more comfortable sharing their thoughts and feelings with others, making it easier to work through their self-esteem issues. Next, it instructs the reader to set aside five minutes a few times a week to complete the worksheet. After two weeks of completing this worksheet, you can review your responses to get an idea of your general outlook on life and see how things have changed since you began. The intended result is for your answers to become more positive over time. Answering these questions can give you helpful insight into yourself, into what makes you happy and what you struggle with. As a therapist, you can introduce this exercise to your client by filling out a few sample prompts together. This can communicate important messages to your client and help them feel more comfortable with the exercise. For example, you can finish the prompt “Right now, I’m happy that…” with “my favorite hockey team won last night.” This can be a good way to defuse tension and start off with an easy and relatively harmless example. If you’d like to see other tips for therapists in administering this worksheet or give it a try yourself, you can find it here or here. For those of you who have read about or kept a gratitude journal, this exercise will feel familiar. Not only can journaling help you to find more things in your life to be grateful for, it can also give you the opportunity to reflect on your own thoughts and feelings, leading to discovery and understanding of the self. The worksheet begins with a short paragraph on the potential benefits of journaling, including improved self-esteem and well-being. The reader is encouraged to use this template to reflect on the meaningful moments of their day, and review the changes in their emotionsand general outlook over time. Next, there are five tables set up with space to write the date and prompts to respond to. You have probably noticed that each of these prompts is intended to provoke positive responses. The positive focus of this exercise is what sets it apart from ordinary journaling or writing in a diary. Even when you have a rough day, these prompts can help you find the good things in your life and remind you that no matter how rough the day was, you survived it. If you are a therapist providing this worksheet to your client(s), encourage them to think critically about what their answers reveal. This exercise can be just a quick and short-term mood boost, or, with commitment and effort, it can facilitate positive growth and development. To see this worksheet for yourself, click here. If you are not familiar with the gratitude journal technique, this worksheet is an excellent way to give it a try. Research has linked gratitude to a multitude of positive outcomes, like increasing well-being, improving our relationships, making us more optimistic, and even helping us to find meaning in our work. Gratitude journaling is one of the best ways to inject more gratitude into your daily life, and it can be done in just a few minutes a day. The gratitude journal worksheet opens with some tips to help you journal effectively, including recording at least five things you are grateful for each day, aiming for one new thing to be grateful for each day, and reading through old entries to see how far you have come since you began. The template is simple, with space for the date, five entries below the prompt “Today, I am grateful for…” and space to respond to “Something I need to express gratitude for…” In this last column, you should think of something that you have not yet expressed your gratitude for, such as a teacher who profoundly affected your development that you never thanked or something you may have taken for granted, like good general health. There are many ways to set up and complete a gratitude journal, but this is a great way to begin. To give this worksheet a try, click here or here. This exercise is a great way to address negative automatic thoughts and self-talk, common problems that people with low self-esteem or mental health issues face. It’s not surprising that talking down to yourself will lead to and exacerbate self-esteem problems, but the good news is that it is not an unsolvable problem. Challenging negative self-talk is a core technique in cognitive behavioral therapy (CBT), a type of therapy that has proven effective in a wide range of conditions, diagnoses, and problems. CBT helps clients discover some of their most deeply held, often unconscious, beliefs, allowing them to evaluate these beliefs and challenge those that are not useful. This thought-stopping worksheet opens with an explanation of negative self-talk and how you can identify and confront it. Next, the negative thought table is presented. It includes six columns intended to help you understand where your negative thoughts are coming from and help you challenge each one. Trigger – in this column, you write down what prompted your negative thought. Maybe you noticed a typo in a paper or report you wrote, or caught a glimpse of your reflection when you weren’t looking your best. Whatever it was, think back to the moment the negative thought first popped into your head, and write down whatever immediately preceded it. 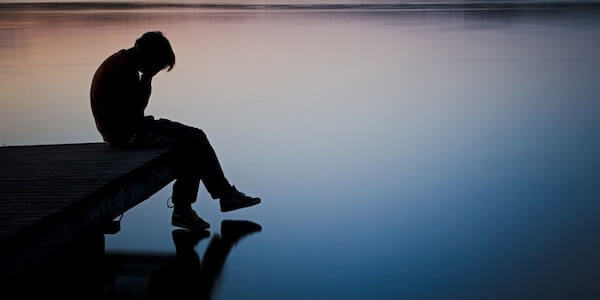 Negative Thought – in this column, you are prompted to write down the negative thought. This might be difficult to do, but remember that we are about to challenge it. Associated Emotion – for this column you think about the emotion(s) that arise when saying the negative thought out loud. Whether it’s anger, sadness, guilt, disgust, or another emotion entirely, write down whatever feelings are provoked by voicing the negative thought. Evidence That Does Not Support the Thought – this is where you must think hard about the negative thought and decide how well it truly applies to you. Much of our negative self-talk is guilty of a cognitive distortion like exaggeration, all-or-nothing thinking, or focusing only on the negative. You will likely find that, even if there is a sliver of truth behind the negative thought, the thought is a truth taken to an extreme. Associated Emotion (Part II) – once you have come up with an alternative thought, say it out loud and write down how it makes you feel. The alternative thought should make you feel more positively than the original negative thought, even if the alternative thought acknowledges that you made a mistake or that your current situation is not ideal. This tried-and-true technique will help you or your client to recognize negative thoughts and challenge them on the spot, leading to greater self-esteem and peace with the self. If one of your clients is having trouble coming up with positive responses to their negative thoughts, encourage them to consider what they would say to a dear friend or loved one who was struggling with these thoughts. Sometimes it’s easier to be kind to others than to ourselves, but that is something that can be remedied with time and practice. Click here or here to view or download this worksheet. Similar to challenging negative thoughts, it can be an extremely effective therapeutic technique to discover, identify, and challenge your core beliefs. We often carry negative or false unconscious or semiconscious beliefs, never stopping to recognize the values and norms that we apply on a daily basis. 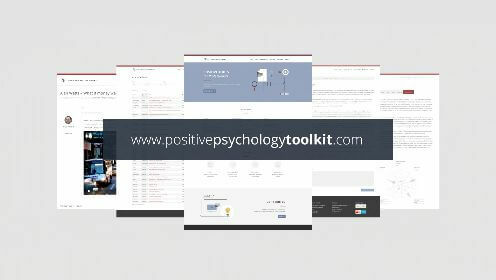 This exercise will help you or your client explore and define your most deeply held beliefs, the beliefs that guide your thoughts and behavior every day. Next, it explains how core beliefs can influence one’s thinking and emotions through an example interaction. Jesse’s reaction: Jesse feels confident as she enters her performance review, and subsequently gets a promotion. Jesse’s reaction: Jesse doesn’t feel great heading into the performance review. She gets a good review but does not get the promotion. Internal thought associated: “There’s no way I’m getting a promotion. My coworkers are smarter than me. Jesse’s reaction: Jesse does not get the promotion. These examples show that the thoughts we carry with us, everywhere we go, can have a profound impact on our feelings, our behavior, and the associated outcomes. Finally, the worksheet presents an opportunity to apply what you have learned from these examples to your own life. You are prompted to identify three negative core beliefs, and three reasons that each belief is not true. It can be difficult to identify the first core belief, especially if you have several very deeply held negative beliefs that you have never even considered challenging before; however, once you get the ball rolling with the first belief, it should get easier as you go. To give this worksheet a try, follow this or this link. Low self-esteem and poor or underdeveloped communication skills often go hand in hand. It can be difficult to share feelings when others if you don’t feel your feelings have value, an all-too-common symptom of low self-esteem. Learning to communicate assertively will not only help you form better relationships and find new opportunities, it can also facilitate a shift in the way you think about yourself. To those with low self-esteem, the word “assertive” may make them hesitant. Being assertive might sound overly aggressive, pushy, or just way too out of character for some people to try. Defined by being too nice or weak, overly compliant, avoiding eye contact, speaking softly, putting one’s self down, being emotionally dishonest, and allowing others to trample you in conversation. Defined by being firm but polite, compromising, maintaining warm and friendly eye contact and a conversational tone, building up others and one’s self, being appropriately honest, and standing up for one’s self. Defined by speaking in a mean, harsh, or sarcastic manner, taking instead of compromising, maintaining glaring eye contact and speaking in loud or threatening tones, putting others down, being inappropriately honest, and bullying or trampling others. The worksheet provides space and instructions to record three instances where you have communicated assertively and list the emotions you felt afterwards. If you can’t think of an instance where you have communicated assertively, don’t worry! You can make that a goal for yourself in the next week. To see this worksheet for yourself and begin building up your communication skills, click hereor here. Apart from these worksheets and activities, there are tons of tips out there on building self-esteem and self-worth. It can be as simple as writing down 10 of your strengths and 10 of your weaknesses. This will help you to begin developing an honest and realistic conception of your self. Comparing ourselves to others is a trap that is extremely easy to fall into, especially today with social media and the ability to project a polished, perfected appearance. The only person you should compare yourself to is you (Grohol, 2011). Say “stop” to your inner critic. Take a 2-minute self-appreciation break. Write down 3 things in the evening that you can appreciate about yourself. Handle mistakes and failures in a more positive way. Stop falling into the comparison trap. Spend more time with supportive people (and less time with destructive people). Remember the “whys” of high self-esteem (Edberg, 2017). 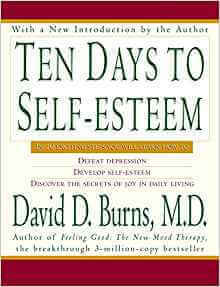 To read these tips in more detail, you can visit Edberg’s blog post on improving self-esteem here. While it can take time to build up a solid sense of self-esteem, you are able to kick start the process if you want a quick boost. For a guide on quick ways to put the process in motion, check out the book Ten Days to Self-Esteem by renowned psychiatrist and author Dr. David Burns. While self-help books are often hit-or-miss, Dr. Burns has an impressive record of success with his patients and his readers. At the very least, it can’t hurt to give it a shot! This book will guide the reader through identifying the causes of low self-esteem and activities and exercises to start improving self-esteem. It’s written in plain English, not psychiatric jargon, and enjoys an impressive four star rating on Amazon. Think hard about the root cause(s) of your insecurities. The first step to defeating a formidable foe is to learn about them, and this situation is no different. Identifying the events that led to a low sense of self-worth can provide invaluable information for challenging these negative beliefs. Use the Negative Self-Talk and Identifying and Challenging Core Beliefs worksheets (available in the adult worksheets section) to help you identify these thoughts and begin to replace them with alternative thoughts. Be kind to yourself. If you find yourself being excessively negative to yourself, stop and consider how you would feel if someone said these things about a close friend or family member. Extend that kindness and compassionto yourself. Make a plan. Set achievable and realistic short-term goals for yourself to complete in the next week or so. That sense of achievement, however small the achievement, can be an excellent boost to your motivation and commitment to improve. You can improve. You can get better. You can reach your goals. It may not feel like it at the moment, but know that no matter how down you might be feeling, there is always room for growth and improvement. If you have used any of these techniques or have another way to boost your self-esteem, please share your experience with us in the comments section.